We've been written up in an industry magazine! 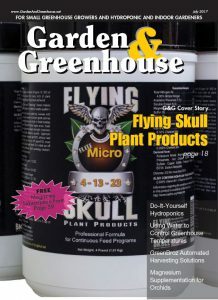 Find out more about our products and what's coming up in Flying Skull news by reading Garden & Greenhouse's cover story on us. The folks at Flying Skull Plant Products know that a business thrives on consistency. They are firm believers in the three supporting concepts that hold a business plan together: consistency, quantity and quality. While many may believe that quality should always come first, quality is dependent on and integrated with consistency. In other words, without consistency, there is no quality. In terms of a business plan, quantity comes in right behind consistency because no matter how good a product is, if a company does not produce enough or their product to sell and cover the costs of operation, it will go out of business.